When America entered World War II in 1941, we faced an enemy that had banned and burned over 100 million books and caused fearful citizens to hide or destroy many more. Outraged librarians launched a campaign to send free books to American troops and gathered 20 million hardcover donations. In 1943, the War Department and the publishing industry stepped in with an extraordinary program: 120 million small, lightweight paperbacks, for troops to carry in their pockets and their rucksacks, in every theater of war. Comprising 1,200 different titles of every imaginable type, these paperbacks were beloved by the troops and are still fondly remembered today. Soldiers read them while waiting to land at Normandy; in hellish trenches in the midst of battles in the Pacific; in field hospitals; and on long bombing flights. They wrote to the authors, many of whom responded to every letter. They helped rescue The Great Gatsby from obscurity. They made Betty Smith, author of A Tree Grows in Brooklyn, into a national icon. 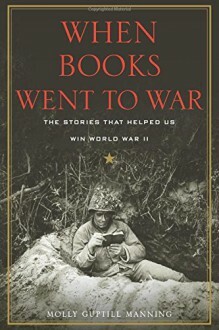 When Books Went to War is an inspiring story for history buffs and book lovers alike. http://sirius.booklikes.com Romance and other things 4.5 Excellent.